In the previous post titled, Remembrance and sacred consciousness, the theme was war and those who are lost in war in the past. Sadly enough there are wars and even more in-humane ways of treating people is going on around the world at this very moment, even NOW. As if we have become so mad that we forgot the sacredness of human life. In the sacred land where once walked Moses, Abraham, Jesus and so many great Biblical Prophets, there is going on this in-humane treatment by the country of Israel on the people of Palestine. How shameful! 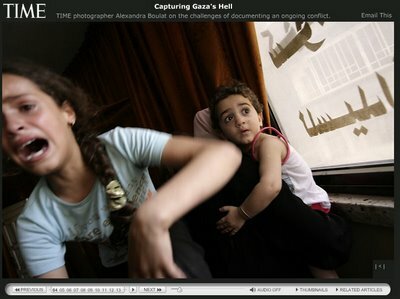 TIME photographer Alexandra Boulat on the challenges of documenting an ongoing conflict. Click here to view and listen to the journalist's own voice. This is another touching photo essay titled, When the War is over. A vivid potrayal of physical and emotional wounds on human being from the wars and conflicts. More photo essays can be found here. + You can donate for the people of Palestine via Islamic Relief.